This article by Brentin Mock is re-posted from Colorlines. Last year was the hottest on record for the continental United States, and it wasn’t an outlier. The last 12 years have been the warmest years since 1880, the year the National Oceanic and Atmospheric Administration began tracking this information. And climate scientists predict that the devastating blizzards, droughts, hurricanes and wildfires we’ve been experiencing lately will worsen due to climate change. In many ways these punishing weather events feel like Mother Nature seeking revenge for our failure to reduce greenhouse gas emissions, the primary cause of global warming. Despite abundant evidence, the U.S. government has yet to pass a law that would force a reduction in these emissions. During his first term, President Obama did make climate change a priority, both in his campaign and in office. The American Clean Energy and Security Act that Congress produced passed through the House in June 2009 by a narrow margin. Yet the bill never reached a vote in the Senate, and it died quietly. Environmentalists have been flummoxed ever since. One prominent cause-of-death theory says that large mainstream (and predominantly white) environmental groups failed to mobilize grassroots support and ignored those who bear a disproportionate burden of climate change, namely poor people of color. With Obama in for a second term and reaffirmed in his environmental commitments, climate legislation has another chance at life. Now, observers are wondering if mainstream environmentalists learned the right lessons from the first climate bill failure and how they’ll work with people of color this time around. To hear some environmental leaders tell it, their defeat wasn’t due to a lack of investment in black and brown people living in poor and working class communities, but to an over-investment in Obama. For example, Dan Lashof, climate and clean air director for Natural Resources Defense Council (NRDC), has blamed the president for having the audacity to push health-care reform and he’s pointed the finger at green groups for being too patient with Obama. Asked what environmental advocates who led the first climate bill effort could have done differently in 2009, Bill McKibben, founder of the online grassroots organizing campaign 350.org, says their game plan was too insular. “There was no chance last time because all the action was in the closed rooms, not in the streets,” he tells Colorlines.com. Yet that “action” took place behind closed doors for a reason: Major mainstream green groups including the Environmental Defense Fund and The Nature Conservancy teamed up with oil companies and some of the biggest polluters and emitters in the nation to form the United States Climate Action Partnership (USCAP). This ad hoc alliance was the driving force behind the failed 2009 bill and there were no environmental justice, civil rights or people-of-color groups at the USCAP table. Obama can’t be blamed for the blindspots of major groups. As recent Washington Post and Politico articles have pointed out, their leadership and membership simply don’t reflect the race or socieconomic class of people most vulnerable to climate change’s wrath. Sarah Hansen, former executive director of the Environmental Grantmakers Association, argued recently that the mainstream has been stingy with funding and resources and inept at engaging environmental justice communities. In a National Committee for Responsive Philanthropy (NCRP) study, “Cultivating the Grassroots: A Winning Approach for Environmental and Climate Funders,” Hansen reported that philanthropies awarded most of their environmental dollars to large, predominantly white groups but received little return in terms of law and policy. Meanwhile, wrote Hansen, too few dollars have been invested in community- and environmental justice-based organizations. According to the NCRP report, environmental organizations with $5 million-plus budgets made up only 2 percent of green groups in general but in 2009 received half of all grants in the field. The NCRP also found that 15 percent of all green dollars benefitted marginalized populations between 2007 and 2009. Only 11 percent went to social justice causes. In January, Harvard professor Theda Skocpol released a study of the first climate bill campaign’s failure and faulted green groups involved for choosing direct congressional lobbying over grassroots organizing. Some of the major organizations did spend money on field organizers, wrote Skocpol, but only to push public messaging like billboards and advertisements. That the environmental movement thought billboards and ads could replace educating and organizing actual people was their biggest flaw, a position shared by Hansen and Skocpol. In comparison, health reform advocates took a lobbying and grassroots approach while the climate-change bill made the rounds and got a law passed. Having people of color on staff might have helped NWF understand that for some, “urban renewal” signifies a historical legacy of black and Latino neighborhoods being effectively erased by development projects such as sports stadiums. Cultural snafus like this have led to white environmental groups being clowned in influential outlets including The Daily Show. In an interview about the unintended message of “Urban Renewal,” Jim Lyon, NWF’s vice president for conservation policy, told Colorlines.com that the group doesn’t “always get everything right” and that “he’d take it back to his staff.” (Ironically, one of the harshest critiques of urban renewal came from Jane Jacobs, a white conservationist.) On the topic of staff diversity, Lyon said the organization isn’t where they want it to be, but that they’ve made “good progress.” He would not release staff demographics, but said NWF achieves diversity through partnerships with other groups and programs like Eco-Schools USA, which he says “engages more than one million children of color” daily. 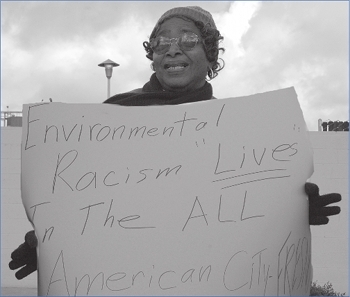 Beverly Wright, who heads the New Orleans-based Deep South Center for Environmental Justice, says racial oversights of traditionally white groups are the main reason black and Latino environmentalists have formed their own organizations. The culturally divided camps sometimes use the same words, but they’re often speaking different languages. Take “cap and trade,” a scheme that would commodify greenhouse gas emissions for market-trading as a way to reduce those emissions. The first climate bill centered on cap and trade because most major environmental groups supported it. But cap and trade was anathema to environmental justice because it did nothing to curb local co-pollutants such as smog and soot, direct threats to communities of color. That’s not to mention that cap and trade was the brainchild of C. Boyden Gray, a conservative member of the Federalist Society and leader of FreedomWorks, today a major Tea Party funder. So in the new round of climate bill talks, will large environmental groups meaningfully engage community-based EJ groups? The prognosis is mixed. Look at MomentUs, a mammoth collaborative started in January to ramp up support for new climate legislation. While MomentUs claims to be a game-changer, the strategy behind it seems very similar to that of USCAP’s—the one that failed to deliver a climate-change law the first time around. On its website, MomentUs describes its board of directors as “cultural, environmental, business, and marketing leaders who offer the diversity of viewpoints and keen insight vital to advancing MomentUs’s mission.” At press time, all of the directors are white. So is the staff, except for one office administrator. Looking at MomentUs partners, it appears that the same traditionally white environmental organizations who teamed up for USCAP are now working with corporations including ALEC funder Duke Energy, predatory subprime mortgage king Wells Fargo, perennial labor union target Sodexho, and Disney. At press time there are no environmental justice or civil rights groups involved. On the other side of the spectrum, The Sierra Club—one of the nation’s largest and whitest green groups—has had an expansive role in environmental justice and advocacy, particularly in the Gulf Coast. In January it joined the NAACP and labor unions in launching the Democracy Initiative, which will tackle voting rights, environmental justice and other civil rights concerns. To be sure, it’s way too early to make a conclusion about MomentUs or the Democracy Initiative, but the latter appears to be a step in the right direction in terms of highlighting the intersection between poor environmental outcomes and racism. McKibben, the 350.org founder, has helped cultivate a multicultural fight against the Keystone XL pipeline project, but he admits that the overall environmental movement has “tons of work to do” on racial equity and inclusion. “The sooner [mainstream environmentalists] absorb the message and are led by members of the environmental justice movement, the better,” he says. In that case, the question is a matter of timing and power, of who decides when and which EJ activists get to lead.